This week I’m sharing my inspiration board for my home design. I wanted to mix classic with laid back influences. My living room will layer texture, vintage pieces and dashes of color!! My design concept is New England Classic meets Southern Cali! Below is a photo of the wall color. I chose a high gloss paint finish from the Clark+Kensington (the color is very similar to smooth slate 5042) line for a dose of glamour. It has been mixed in a custom deep grey shade. I had the floors finished and stained a medium brown. They’re richer and deeper looking in person and show off the floor grain beautifully! Be sure to check in with the other participating bloggers! (see all the links below) I can’t wait to share more details with you all next week! I’m pretty happy with how it’s turning out! Eek! Your board is incredible — can't wait to see this come together! Great inspirations. Looking forward to see more next week! The wall color is beautiful! I would love to have our floors refinished darker one day. love the dark walls. We had something similar in our master bedroom in our last house. so cozy! Love the inspiration board! The fur throw and agate are enough for me. Cannot wait to see more. I'm in love with the color. It is looking great! 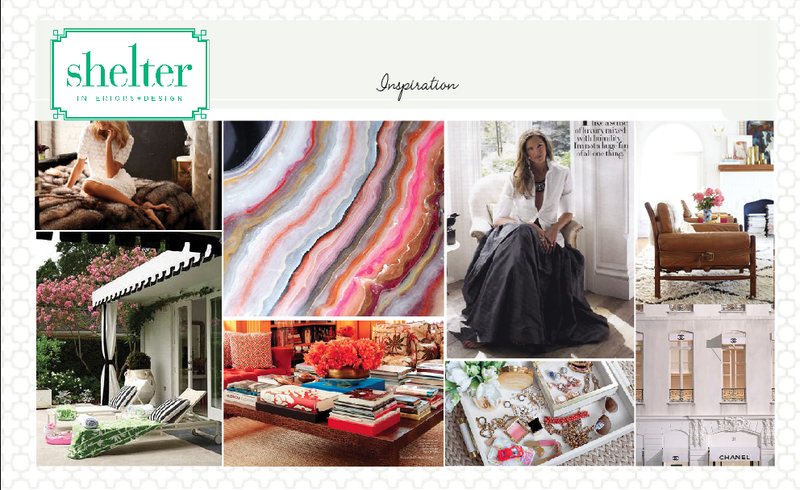 I love the agate in your inspiration board. I've always wanted to try high gloss walls but I've been afraid to pull the trigger. Can't wait to see how yours turn out! The floors are so warm and rich! There is not much prettier than a dark gray and the stain color of your floors. With your talent I am sure this room is going to be a stunner. Love the wall color and the high gloss gives it a modern edge! Gorgeous color and that high gloss takes it to the next level! Looking very good from the start! Love the wallcolor and the rich brown floor! I love your walls and floors. That inspiration board is perfect. All of this makes me home-sick for California. Can't wait to see more. That floors is nuts! I want it. Love the inspration board too.